Imagine a society in which rich people can buy their freedom while the poor remain locked up for minor crimes, forfeiting their jobs, housing and even their children. It’s not a dystopian future or a scene from “Les Misérables.” It’s the state of our costly and ineffective bail system. Now, lawmakers have a chance to fix it. In the bail world, cash is king. Being able to pay up outweighs the threat the defendant poses to public safety, his or her ties to the community and the circumstances of the alleged crime. SB 210 by Loni Hancock, D-Berkeley, which passed last week in the California Senate and is headed for the Assembly, would encourage the courts to consider these factors through an evidence-based risk assessment. Those least likely to re-offend or skip their future court dates would be released from jail and put onto pretrial supervision, similar to probation. The International Association of Chiefs of Police, the National Sheriff’s Association and the Conference of Chief Justices all support pretrial supervision and risk assessment as a safer alternative to strict money bail. Today, 65-70 percent of county jail inmates statewide are awaiting trial. In the Bay Area, the number is even higher at about 85 percent. In other words, they are doing the time without having been convicted of the crime, all the while creating a drain on the taxpayers. In the Bay Area, it costs more than $100 a day to keep someone behind bars. By contrast, pretrial supervision can cost as little as $2.50. The bail system has been with us from the beginning, brought over from England where it had been employed for centuries. Though our Eighth Amendment states that “excessive bail shall not be required,” the meaning of “excessive” has been stretched to its limits. The problem is only getting worse. Bureau of Justice Statistics show that average bail amounts have increased by more than $30,000 between 1992 and 2006. San Francisco is no exception. On Jan. 1, the local court raised its bail schedule for most offenses by tens of thousands of dollars without explanation. Bail for contempt of court, for example, doubled from $10,000 to $20,000. Annoying phone calls skyrocketed from $5,000 to $10,000. Under current law, each local court may set its bail schedule as it sees fit without any public input or review. It is no surprise that poor people are the casualties of this wealth-based bail system, which coerces them to plead guilty even if they are innocent. A 2012 study by the Justice Policy Institute found in as high as a quarter to half of cases nationally, the detained individual pleads guilty just to get out of jail and back to their jobs and families. Long pretrial detentions disproportionately affect communities of color. Numerous studies have shown that African-Americans are assigned higher bail amounts and are less likely to be released on their own recognizance. SB 210 is not an untested idea. Three California counties have already implemented similar programs, using risk assessment tools to determine which defendants pose threats to public safety. The evidence-based method has proved wildly effective. In Santa Clara, 88 percent of defendants released on pretrial supervision made their court dates and 98 percent did not re-offend. Sacramento was able to reduce its pretrial jail population to 55 percent while 95 percent of those released made their court dates. In Santa Cruz, 92 percent of those released did not re-offend, and 89 percent attended all of their mandatory court appearances. The entire state must follow the leads of these counties. We cannot afford to do otherwise. 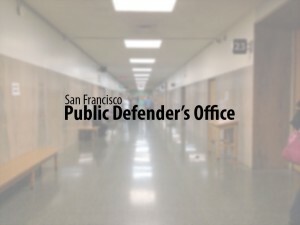 Brendon Woods is the Alameda County public defender, Robin Lipetzky is Contra Costa County public defender, Jose Varela is Marin County public defender and Jeff Adachi is San Francisco public defender.